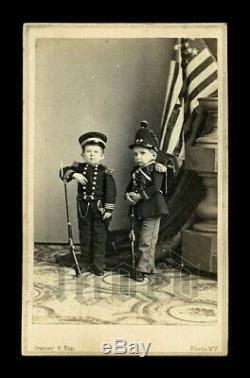 Original 1860s CDV, two little people sideshow personalities dressed as Civil War soldiers. Commodore Foote is on the left and and his Dutch recruit Major Tot on the right. Very good to excellent antique condition. Gurney & Son's 707 Broadway, New York studio imprint on the back. Back is clean and undamaged. The item "RARE 1860s Gurney Sideshow CDV Photos Little People Civil War Soldiers" is in sale since Saturday, April 13, 2019. This item is in the category "Collectibles\Photographic Images\Vintage & Antique (Pre-1940)\CDVs". The seller is "jack_mord" and is located in Woodinville, Washington. This item can be shipped worldwide.